After a day of shopping and a few disappointing meals, I decided to head on over to Rainbows. 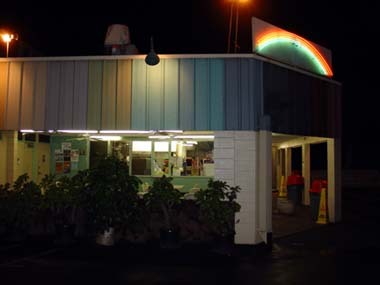 This is one of Hawaii's premier "drive-in" restaurants and has been since 1961. This place serves great local-style favorites and has been one of my favorite eating spots since I can remember. 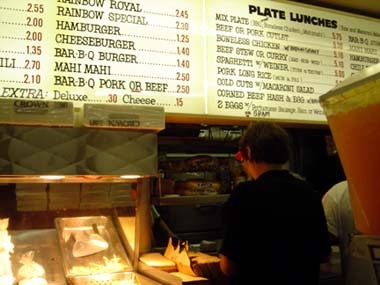 Rainbows is one of the few remaining plate lunch/burger drive-ins from bygone era. Many others, such as Kenny's Burger House in Kalihi, and Burgerland Drive Inn in Kapahulu, have since closed. This place still has the classic menu boards and all of the local-style offerings such as teri beef, boneless chicken and beef stew. 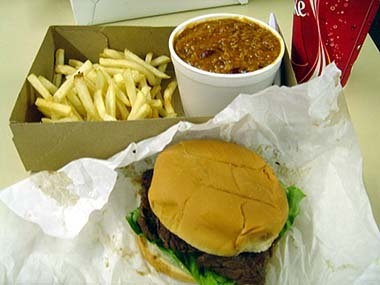 Tonight, I had the Bar-B-Q beef sandwich (US$2.50), french fries (US$1.20) and chili rice bowl (US$1.90). The Bar-B-Q beef sandwich is one of the best around. 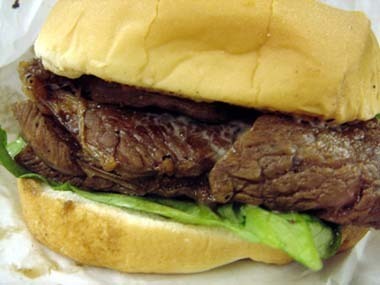 The sandwich comes wrapped in the traditional white waxed paper and is piled high with lean Bar-B-Q beef. The beef is tender (can you say melt in the mouth?) and the flavor is just right. Where else do you think you can find another sandwich like this? In my opinion, this chili is better than Zippy's. Just the right amount of spice and plenty of ground beef...no fillers! The bowl is actually just the right size to accompany my sandwich! Next time you're hungry, stop by Rainbows for some awesome local-style grinds. The food here is delicious and served in generous quantities at a reasonable price. I love chilli. We don't get chilli like those in Western countries. Umami, I like the chili too. It's actually the best that I've tasted...outside of homemade. If you want, I can pass you a recipe. Perhaps you can try to make it at home. Welcome to the site! I'm sure you've noticed that most of the posts are geared towards Asian food. I'll be doing more posts about hole in the wall places as well as my favorite "plate lunch" places. Glad that you've stopped by! 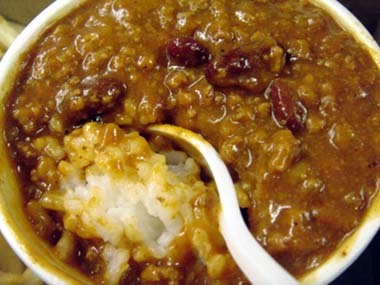 I'd love to get the recipe, if you have it, of Rainbow's Drive Inn chili. This, along with Sekiya's fried hash balls, are the two things I most about Honolulu. Thanks for dropping by the blog. I wish I had the recipe for Rainbow's chili too. I'd make a killing. Perhaps I should ask my cousin for it. She used to work there back in the 80s. When we were there we ate at Rainbow about 5 times. I JUST realized, I never once had a hamburger! ::whimper:: I've missed out! I'm doomed! Life as I know it will cease to exist! I've failed as a human bean! FOR PITY'S SAKE! MAIL ME A HAMBURGER! By the way, I noticed you moved the shrimp! Yes, redid the banner a bit as I changed the layout from 2 to 3 sections (had to make way for Google AdSense). Rainbow Drive-In is OK for burgers, an even better place is W&M. It was a more recent post. I miss Rainbow...go there whenever I make it up to Oahu. The Boneless chicken plate with brown gravy is the bomb!! Welcome to 'Ono Kine Grindz! I think either the chili or the boneless chicken with gravy is my favorite. I think I need to go to Rainbows again soon. I've had the teriyaki at Rainbow's which is awesome, but never the spaghetti. I'm going to have to try it sometime. I left Hawaii back in 1985 to live in California, and haven't been back to the islands since 1986. I know...shame on me!! I'll be visiting soon and wanted to ask you about restaurants since I'm sure it's changed a lot since then. If you can give me any suggestions on restaurants with ono local food, that would be great! I'd be more than happy to give you some recommendations on a few places. You can e-mail me at onokinegrindz at yahoo dot com. A trip to Hawaii is never complete without a plate from Rainbow Drive Inn. i took my wife to Rainbows last week since we were in the area and wanted to wait for traffic to die down a bit before heading home. this was my first time ever going to Rainbows & i must say i wasn't too impressed. must be because i didn't grow up going there like most of you. the boneless chicken w/gravy was just "ok". my wife had the chili & it tasted watery compared to zippy's chili. i'll still take zippy's chili as #1 and L&L's chili a close #2.
just my observations, thats all. Thank you for your observations. There is no place that I know of that appeals to everyone and you are definitely entitled to your opinion. That said, where do you go to get a good boneless chicken with gravy plate? I would like to make the Rainbow's chili because it is my favorite. Could you email me the recipe if you have it? Thanks! I love Rainbow's chili too and unfortunately I don't have the recipe for it. =( I'm sorry. Perhaps one of my other readers has it and is willing to share. Anyone? Just wanted to say the food at Rainbows is ono awsome. I live in Michigan and would have to say I travel just to get the grinds at the Rainbow. Love the food the people and the atmosphere is unmatched. I love the food at Rainbows and you're right about the atmosphere. I'm sometimes amazed at the people I see eating there.